CARACAS, Venezuela — The new head of Venezuela’s increasingly defiant congress was pulled from his vehicle and briefly detained by police Sunday, a day after the U.S. backed him assuming the presidency as a way out of the country’s deepening crisis. The confusing incident, which drew swift international condemnation, is bound to ramp up tensions between the opposition and government following President Nicolas Maduro’s swearing in for a controversial second term this month. A video circulating on social media purports to show the moment in which Juan Guaido is intercepted on his way to an anti-government town hall meeting in the port city of La Guaira. In the video shot on a cellphone by a motorist stuck in traffic, several men in ski masks and carrying assault weapons are seen struggling to shut the door on someone being pushed into an SUV before racing down a highway. While it was not possible to identify Guaido in the 33-second video, his wife, Fabiana Rosales, said on Twitter that he had been detained by a commando unit of the feared SEBIN intelligence police. As news of his detention spread, he was then released. Adding to the confusion, the government tried to shift the blame to Guaido’s allies, with Communications Minister Jorge Rodriguez saying that the “media show” had perhaps been orchestrated to provoke an international uproar. Still, he acknowledged that police officers had partook in the arrest and said they would be disciplined. “We want to inform the people of Venezuela that the officials who took that upon themselves are being dismissed,” Rodriguez said on state TV. U.S. Secretary of State Mike Pompeo called on Venezuela’s security forces to uphold its citizens’ constitutional rights, singling out Intelligence Chief Manuel Cristopher Figuera. “The U.S. and the world are watching,” Pompeo tweeted. 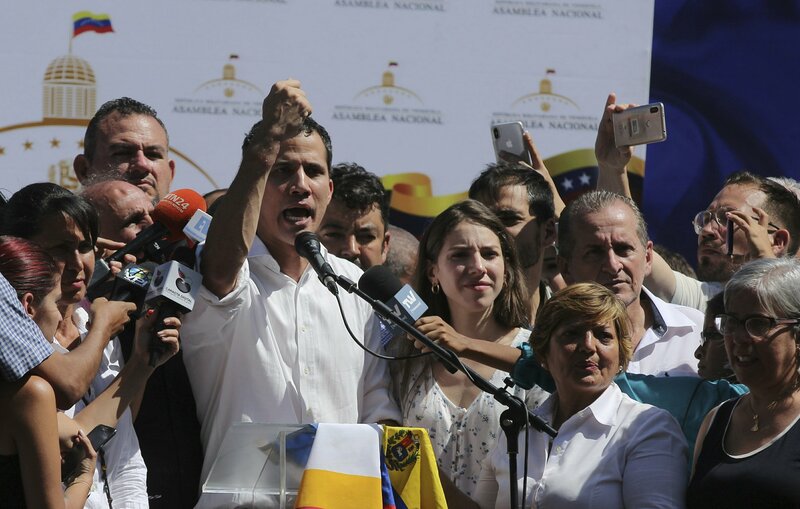 At the rally Sunday after the incident, Guaido told The Associated Press that the SEBIN agents informed him they were carrying out orders from above when they arrested him. Guaido has been leading an increasingly tense standoff with Maduro seeking to oust the socialist from power, winning the support of some powerful international allies like U.S. Secretary of State Mike Pompeo, who spoke to him by phone shortly after the 35-year-old assumed the presidency of the opposition-controlled National Assembly. At a rally Friday he said he was prepared to take over as Venezuela’s interim president and call for new elections, a move the U.S. and regional governments support. But for such a strategy to succeed, he said Venezuelans must take to the streets to express their discontent with Maduro’s handling of what was once Latin America’s wealthiest nation. To that end, he called for nationwide demonstrations Jan. 23 to coincide with the anniversary of the 1958 ousting of military dictator Marcos Perez Jimenez. Guaido said that comments by Rodriquez, the government’s spokesman, reveal a broken chain of command between Maduro and Venezuela’s armed services.